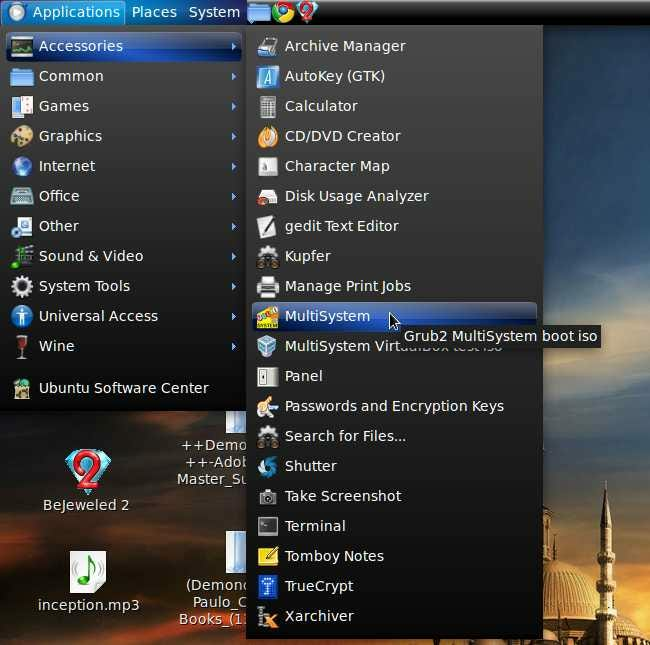 MultiSystem is a really easy tool made to run on Ubuntu and Ubuntu-based distros that you can use to play with various LiveCDs at once, or to create the ultimate recovery device. If you don’t use Ubuntu, you can use an Ubuntu Live CD to install MultiSystem so that you can create your super live USB drive without having to run Linux as your main OS. It’s best to download your ISOs ahead of time, and select a USB drive large enough to house them all. I actually went with an 8 GB SD card (used via a USB adapter). 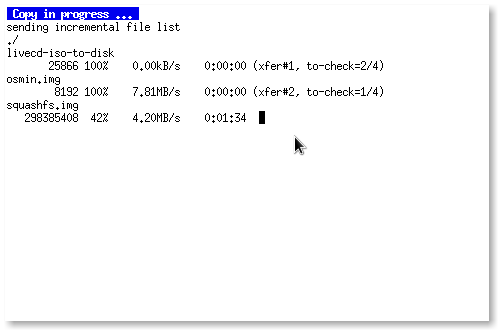 Here are some of the popular and interesting distros I used. Kubuntu, a KDE-oriented version of Ubuntu. Linux Mint, another novice-friendly distro that aims to get more usable out of the box. It is also 100% compatible with Ubuntu packages. Linux Mint Debian Edition, like Linux Mint except it’s 100% compatible with the Debian testing build. Debian, one of the older and more central distros out there. It has both a “stable” build and a “testing” build. Fedora, which used to be RedHat and is another big distro. It aims at power, and has several “spins”, which aim to work out of the box for different purposes. Fuduntu, A Fedora-based distro with some important optimizations for netbooks, like adding Fewt’s Jupiter tool and moving /var to a ramdisk. Slax, which is based on simplicity and up-to-date software, but also the ability to run smoothly on older hardware, just like its Slackware roots. It uses modules instead of installed software to make this easy. 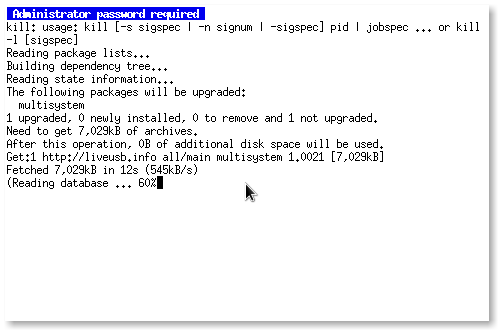 OpenSUSE, an easily-configurable distro that has been around for quite a while. BackTrack, a distro aimed specifically at penetration testing. Great for testing how secure your – or your friend’s – network really is. There are plenty of other amazing distros that work great, such as Arch, Slackware, ZenWalk, Cent OS, etc., but work best when installed. If you want to find more Linux distributions, check out DistroWatch.com, and you can also take a peek at MultiSystem’s Compatibility Page for more ideas. Head over to the MultiSystem Download Page, and grab the installation script. The website is in French, but if you’re not comfortable there’s a translate option on the right, s’il vous plaît. Just pop that in and you’ll be good to go! Let’s take a look at the Selection window. Enter your password when prompted and watch it do its thing. When it’s done, it’ll return to the Selection window, and you can select your USB drive from the list at the bottom. Click “Validate” and you’ll see the main window pop up. 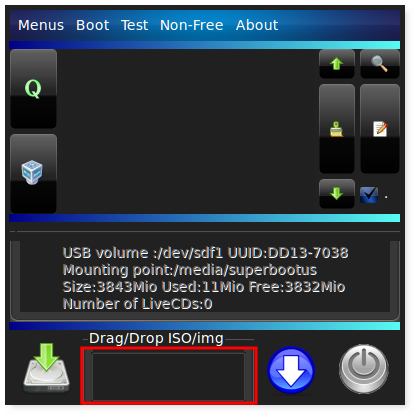 Just drag and drop an .ISO file into the highlighted area to add it to your USB drive. You’ll see a window pop up with file progress. Once it’s done, just lather, rinse, and repeat. Upon booting from your device, you’ll see a veritable plethora of options. 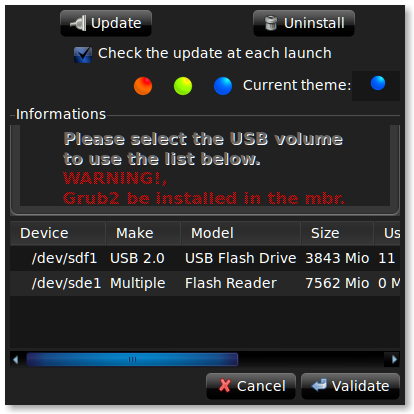 Essentially, MultiSystem downloads and installs GRUB2 to your USB drive, along with SYSLINUX and GRUB4DOS. These are tools that allow the booting of multiple OSs in various ways. It then takes care of creating the proper entries for each bootloader and copying the files over to your USB drive. Support isn’t limited to Linux. 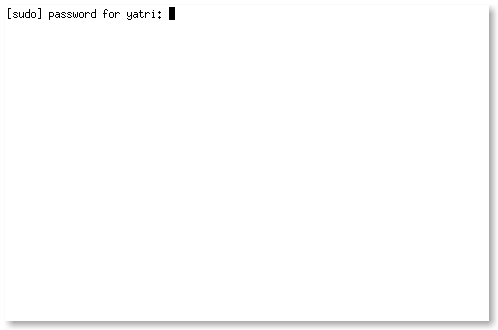 It supposedly works with Windows ISOs and XBMC, as well as other utilities like Hiren’s BootCD, since it uses SYSLINUX in addition to GRUB2 and GRUB4DOS. Your mileage may vary from update to update, though. Share your experiences in the comments!